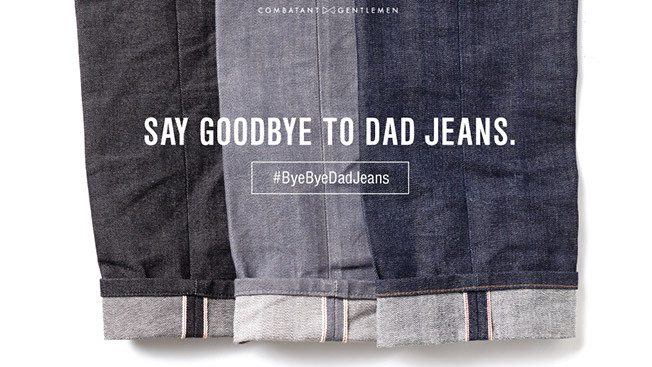 Combat Gent is launching a Father’s Day digital campaign today to scout out dads who still think acid wash Levi’s jeans are cool by replacing them with more modern trousers. The online menswear retailer is using the upcoming holiday to launch a new line of denim products also launching today. The Facebook, Instagram and Twitter campaign asks consumers to send in pictures of "dad jean offenders"—think "Obama jean, high-waisted" styles that went out of style years ago—with the hashtag #ByeByeDadJeans, according to Vishaal Melwani, co-founder of Combatant Gentlemen. Submissions will run through June 9, and tagged photos will then be published on Combat Gent’s accounts next week. Fans can vote on which look is the worst by "liking" and retweeting images. The winner—or style loser, depending on how you see it—will win three pairs of Combat Gent jeans. Based on the results from recent previous campaigns, Combat Gent expects for the Father’s Day effort to directly impact sales. The brand ran a similar photo-based social campaign for Memorial Day, resulting in a 15 to 20 year-over-year boost in sales during the weekend as a result of using social. These promotions have also bumped up organic search results from consumers who learn about the brand first on social. As an online pure play, the goal is that these one-off, time-sensitive campaigns will pay off in driving repeat sales and loyalty for Combat Gent. Melwani wasn’t sure on how many of these campaigns the brand runs each year, but estimated that there could be 20 to 30 contests to constantly boost social engagement. "More importantly is the influx of consumers that are seeing the brand for the first time," Melwani explained. "A lot of people on Facebook or Instagram will just promote their products instead of promoting the overall campaign."